Breakfast in the slow cooker is a pretty novel idea. I mean, you throw a few things in there before bed and then wake up to a hot breakfast . . . along with a home that smells warm and cozy. If you ask me, this is so perfect for fall as most of us yearn for warmer recipes and cozy smells. 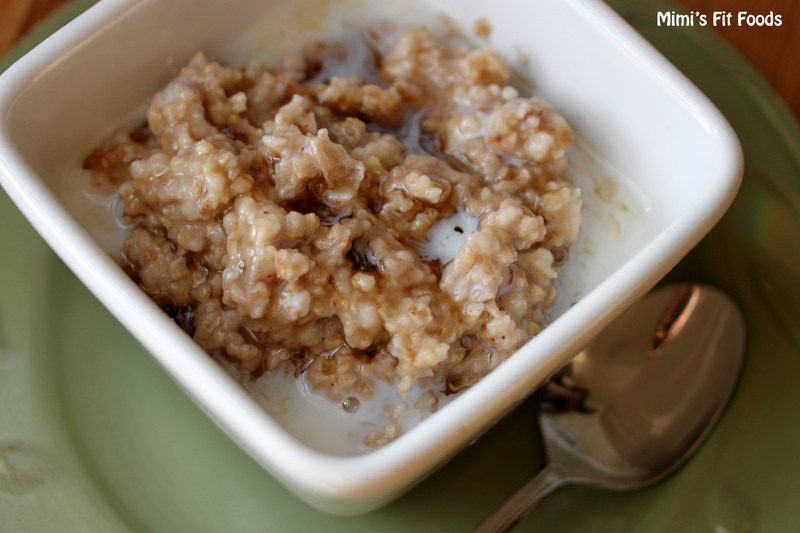 If you enjoy oatmeal, you’ll enjoy eating steel cut oats from the slow cooker. They taste very similar to rolled oats, but seem to taste slightly heartier and also have a heartier texture. This is a very basic recipe on how to cook steel cut oats in the slow cooker. I’m hoping to make “fancier” versions this fall to share with you all. However, because it technically is fall, I added about 1/2 teaspoon of cinnamon to the oats when I put them in the slow cooker (this is totally optional). I think that cinnamon elevates the flavor of oats and makes them taste a little sweeter without adding sugar. The cinnamon also creates a wonderful aroma when mixed with the cooked oats. When I dish my portion out of the slow cooker I love to add a little drizzle of sugar-free maple syrup (it’s only about 10 calories, so why not!?) and a splash of milk. This was definitely comforting and very filling (thanks to the heartiness). Stay tuned for “fancier” versions in the near future. Mix oats and the rest of the ingredients into the slow cooker. Cook on low for 6-8 hours. If desired, serve with a drizzle of sugar-free syrup and a splash of milk. *Note: Most sites claim that steel cut oats are gluten free. I know several people who are gluten intolerant that perform just fine after eating steel cut oats. However, if you have a strong gluten allergy, you may want to buy steel cut oats that are actually labeled gluten free. I am going to try this! I am all for a heartier breakfast. So how do you reheat this? You just throw it in the microwave. How long you microwave it will depend on the portion size you’re reheating. I usually start with 1 minute at 50% power and then test it and add more time if it’s not at the temperature I want.